As we left Raccoon Valley in Tennessee, the weather had turned a little cooler. 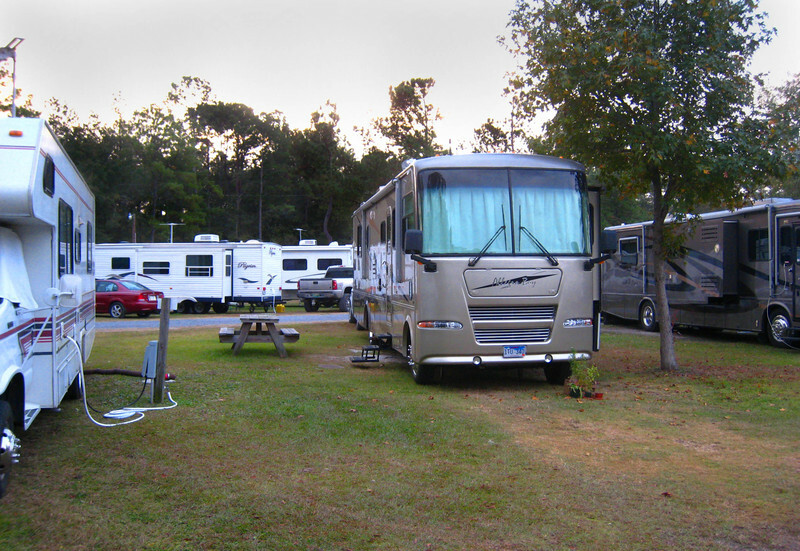 On our way to Myrtle Beach, we made an overnight stop at Magnolia RV Park (a Passport America campground) in Kinards, SC, where we once again caught up with the warm weather. Although Magnolia is a former KOA, the sites are surprisingly large. There are numerous trees, but the owners were very accommodating and gave us a site that would be good for our satellite. The sites and roads are gravel. The owners are new and they seem to be making efforts to spruce up the place, not that there is really anything wrong with it. 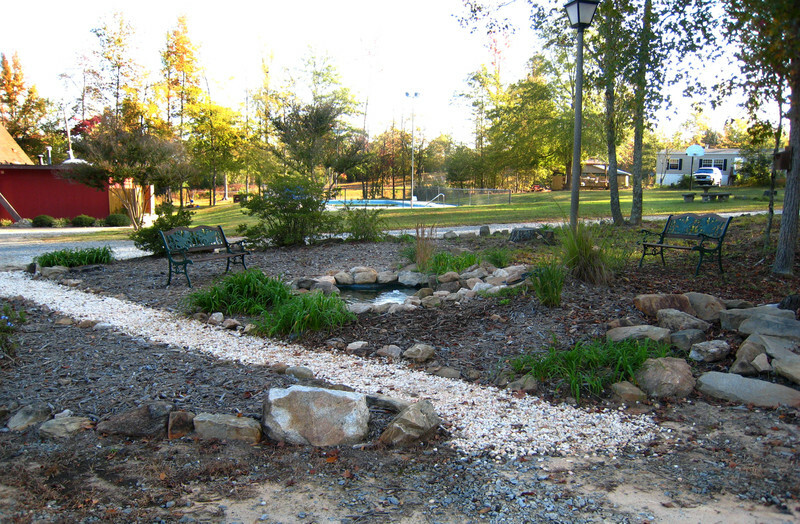 Right outside our door was a little park-like area with a pond, waterfall, and benches. We loved hearing the water trickling. It reminded us of the water feature we had in our stick house. The next morning, we got up and took our time packing up. 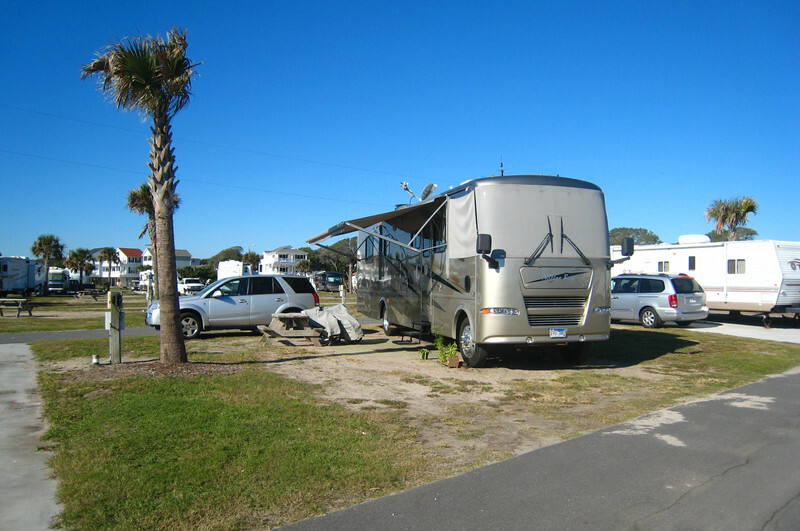 Ocean Lakes Campground in Myrtle Beach, our destination, has a 3:00 check-in. Although we didn't expect our site to still be occupied that late in the day in the middle of the week and in the off-season, we still weren't in a big hurry. As Paul made his final walk-around before leaving, he noticed a problem. The right rear outside dual was completely flat. He called our roadside assistance (Coach-Net) to come and repair the tire. While waiting for them to arrive, he went outside to investigate the tire further and found the head of what turned out to be a 1" long bolt sticking out from between the treads. The road service truck arrived in about a half an hour. It turns out they were located just at the end of the road at the interstate exit. The tire was dismounted and quickly repaired. With a little over an hour delay, we were on our way. We had paid for our Ocean Lakes campsite in advance so we got an express check-in packet that included our windshield pass. That meant we were able to drive right in without having to stop and stand in line to check in. That's a nice feature even in the off-season, but it would be almost a necessity in the summer when the campground is very crowded. We really liked Ocean Lakes when we were there in November last year, and we had reserved the same site. The sites are relatively large and have full hookups including cable and telephone. Some sites are concrete, but they cost an extra $5 a night so we get a sandy site and put out our patio mat. 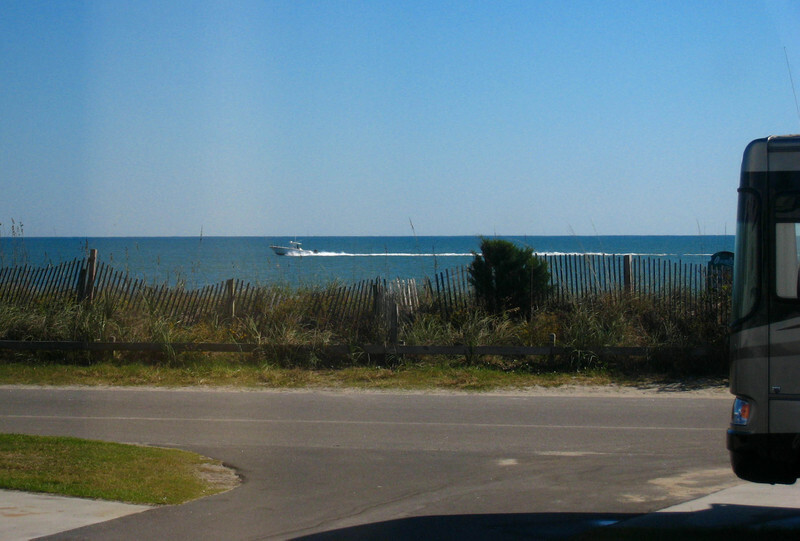 The photo below is the view out our window. 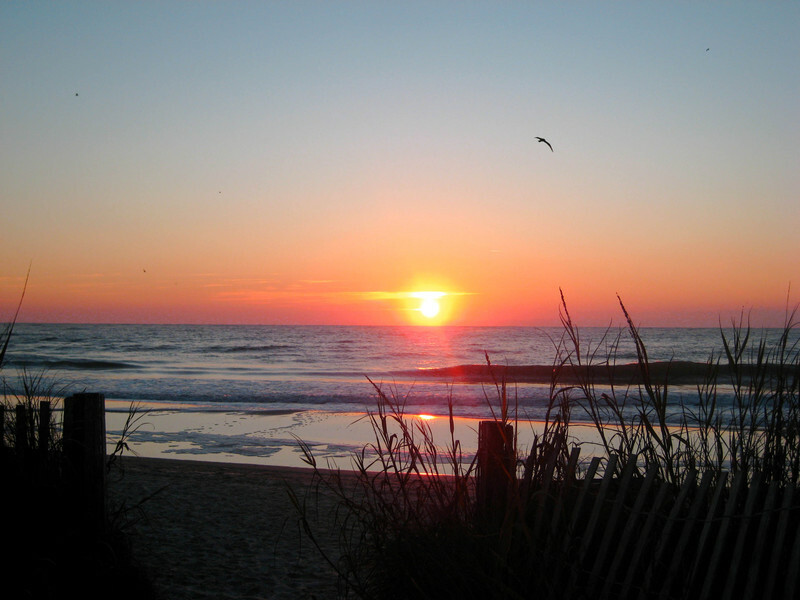 On November 1, Ocean Lakes goes to reduced winter rates, which are a lot more affordable. The campground is nowhere near full, and it's usually easier to get a site near the beach. We like falling asleep to the sound of the ocean. 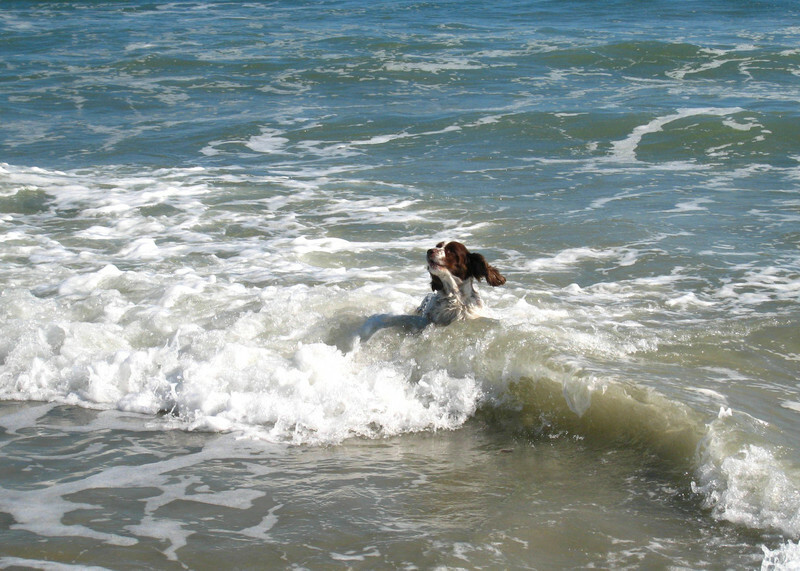 The weather is usually still warm enough to walk or sit on the beach and for Molly to swim. 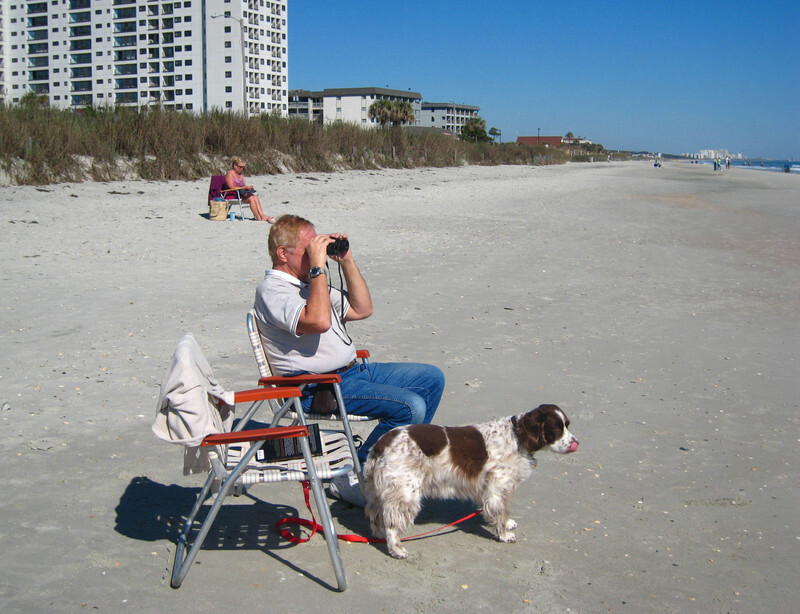 Dogs are allowed on the beach in the off-season. Here, Paul and Molly are checking out some boats passing by. And here is Molly enjoying the water. She almost looks like she is trying to body surf. Ocean Lakes is like a small city. They have their own garbage truck, their own security force, their own RV dealership, a huge laundry, a well-stocked store, a golf cart rental agency, a restaurant, and their own real estate company to handle sales and rentals of their beach houses that are on the premises. As much as we like Ocean Lakes off-season, we don't think we would be happy there in the summer. It's just too big if they would be anywhere near full. We have read a lot about kids and teens running around and the large number of golf carts. This would be a nice safe environment for kids to have fun, meet new friends, and hang out; but since our kid is grown, we generally like things a little more quiet and peaceful. While in Myrtle Beach, we didn't do any sightseeing. The only thing we needed to do was go to Costco to have new tires for the Saturn Vue mounted. We had ordered the tires online while we were still in Knoxville. Our rooftop internet satellite continues to be one of our very favorite traveling accessories! :) They were on sale so that even with having to renew our Costco membership which we had allowed to lapse since going on the road, the tires were still cheaper than what we could find at a discount tire retailer. Margery was particularly happy to have the membership so she could get her super-sized (4 lbs.) of Walkers Shortbread which Costco carries prior to the holidays every year. In addition to our Costco stop and a stop at Camping World to pick up some caulk for the motor home roof, we rode our bikes and sat on the beach a several times. We just had a good time relaxing. Paul especially enjoyed the beautiful sunrises over the ocean. Then it was on to Charleston, only a little over a 2-hour drive from Myrtle Beach. Even though we didn't rush, we pulled into Lake Aire RV Park fairly early at a little after noon. Lake Aire is about 20 minutes southwest of Charleston's historic downtown district. There is a combination of open and wooded sites, although many of the wooded sites appear to be seasonals. We, of course, got an open site for our satellite dish. Satellite aside, we actually prefer open sites because we like grass as opposed to the dirt and leaf debris usually found in shaded sites. The sun is also quite welcome on these cooler fall days. Most of the sites are decent size and we got an extra-long pull through. 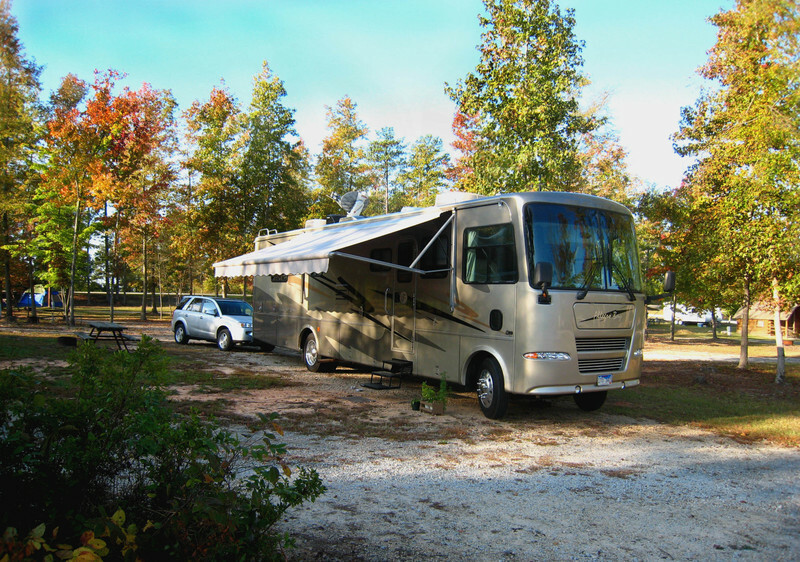 Lake Aire is a Passport America campground, which means the base rate is discounted 50%. There are some extra add-on fees that are not subject to the discount, but the price was still fairly reasonable for full hookups. The only negatives are the somewhat dusty internal gravel roads and the trains. The tracks are only a few hundred yards away, and the trains run every hour or so blowing their horns at the nearby crossing. On our first full day in the Charleston area, we visited the Charleston Tea Plantation, which is located on Wadmalaw Island in South Carolina Lowcountry. The 127-acre Charleston Tea Plantation is the only place in North America where tea is grown commercially. Tea plants (camellia sinensis) are from the camellia family. The South Carolina Lowcountry location provides the warm temperatures, humidity, and rainfall necessary for the plants to flourish. The plants at the Charleston Tea Plantation are from cuttings from plants that belonged to a tea operation in Summerville, SC owned by Dr. Charles Shepard, a wealthy scientist and philanthropist. The first plants date back to 1888 and came from China and India. The original plantation, the Pinehurst Tea Plantation in Summerville, lay derelict from about 1915 until 1960 when it was purchased by Lipton and moved to its present location on Wadmalaw Island. Lipton sold the plantation to tea expert Bill Hall in 1987. 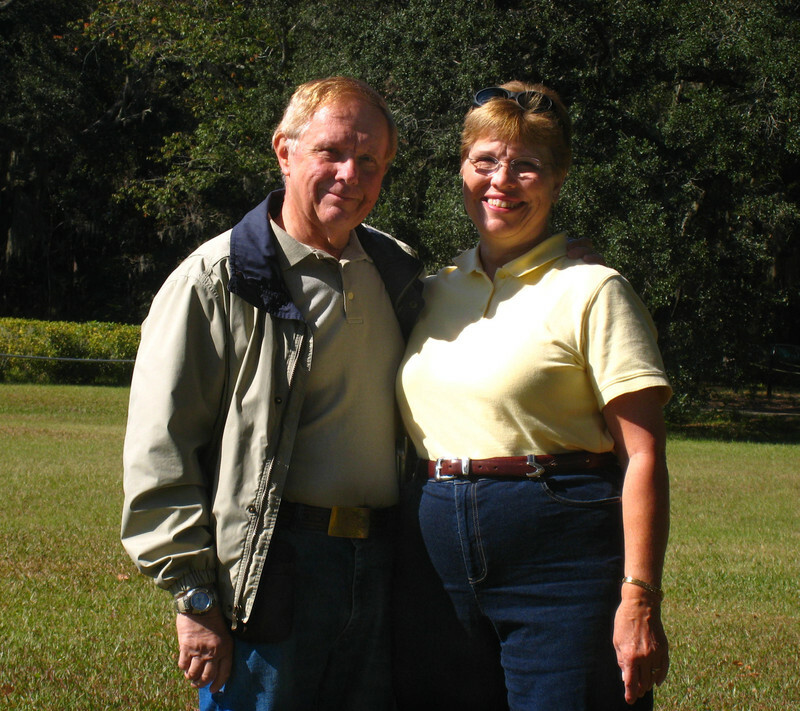 In 2003, H. W. Bigelow, Inc. purchased the plantation from Bill Hall and worked with him to modernize it and make it visitor friendly. Bigelow is known for their Constant Comment Tea. However, Constant Comment is not produced in Charleston. 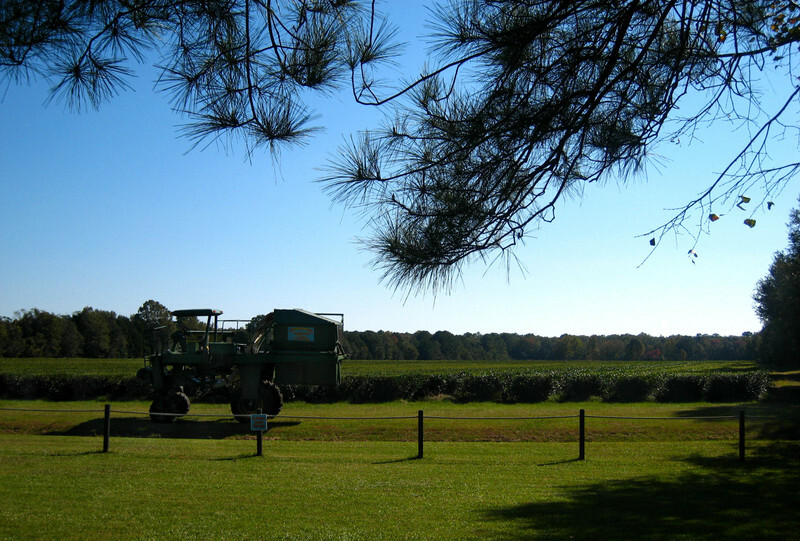 Today at the Charleston Tea Plantation you can take a plant tour and a trolley tour of the fields. The photo below is a field of tea plants with the harvester in the foreground. Paul and Margery strolled out to one of the fields near the parking lot. Even though the harvest is over for the year and they are no longer processing tea, we found the factory tour fascinating. There is a glass-enclosed mezzanine overlooking the production area. They have several wide-screen TV monitors set up that show the tea processing while the narrator explains what is going on. The process is not too complicated; but even though we drink iced tea almost every day, we had no idea what the plants were like, how they were grown, or how the tea was processed. Tea is harvested from May through September. The plants are dormant the rest of the year. The harvester shown in the photo above has a sickle-bar cutter that cuts off only the top new growth of the plants every 2 to 3 weeks. Immediately after harvesting, the leaves are brought into the factory and they are fed onto the withering bed where they spend 18 hours on the mesh conveyor. Air circulates through the 12" deep bed of leaves to remove some of the moisture and prepare them for the next step. The photo below shows the withering bed. The leaves are then fed through a shredder to rupture the cell walls and expose the liquids in the cells, after which the leaves undergo oxidation. The amount of time the leaves spend in the oxidation beds determines the type of tea produced and its flavor. For black tea, the most popular, leaves spend 50 minutes in the oxidation bed resulting in full-bodied, dark orange tea most of us are used to seeing. Oolong tea, which is the amber tea usually served by Chinese restaurants, spends only 15 minutes in the oxidation bed. Green tea, which is pale amber and which is said to possess some health benefits due to anti-oxidants contained in the tea, does not undergo oxidation. The oxidation process is stopped by drying the tea at 250 degrees for about 25 minutes. From the start of the process, the tea leaves will have lost 97% of their moisture and 80% of their weight. That means it takes 5 pounds of tea leaves to produce 1 pound of tea. 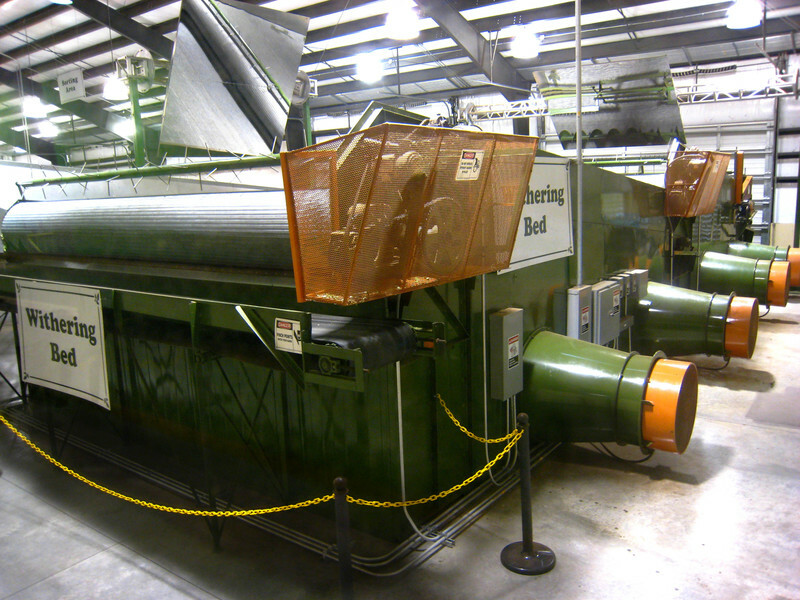 After drying, the tea undergoes additional cleaning to remove stems and fiber and then goes to packaging. The sample of iced tea we had at the gift shop was DELICIOUS! We usually drink decaffeinated tea, but the tea produced at the Charleston Tea Plantation is all regular caffeinated tea. We were advised that it is heat that releases the caffeine in tea so if we were willing to make "moon tea," we would be able to enjoy a low caffeine version of their delicious tea. Moon tea is similar to sun tea since is not brewed with boiling water, but the name moon tea refers to the fact it is steeped out of the sun since the sun does heat the water somewhat. So we bought our box of 48 tea bags and soaked 5 of them overnight in cool water and voila - the tastiest iced tea we have had since we don't remember when! The moon tea was so good, we went back and bought a couple more boxes of tea bags. We stuck around the motor home for the weekend and left the sightseeing to the weekend warriors. We did our weekly cleaning, Margery did some laundry, and Paul washed the motor home. 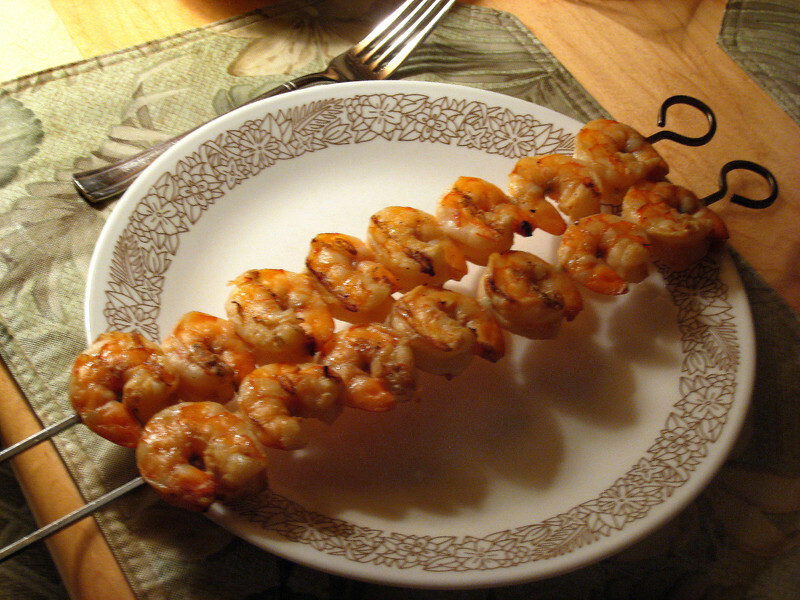 On Sunday, we watched some of the Steeler game after church, switching back and forth between it and the NASCAR race, and we grilled some delicious local shrimp for dinner. Yumm! In the south, there are many roadside shrimp/fish vendors around the coastal cities. Speaking of laundry, we're getting a lot of use out of the clothes drying rack we hang on the ladder on the back of the motor home. We purchased it from an RV entrepreneur when we were in Mission last March. Drying clothes on the line is something we have always enjoyed, and now we have sun-kissed, fresh-smelling sheets (and jammies) again. Drying clothes in our combo washer/dryer works fine, but there are a lot less wrinkles in our clothes if we hang them out to dry. 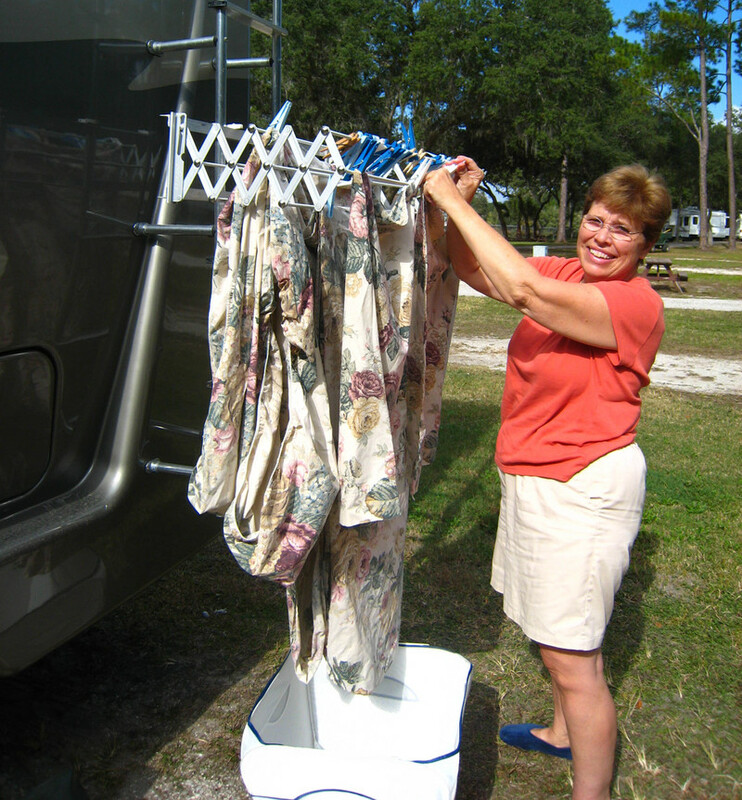 A few campgrounds prohibit clothes hanging outside your RV, but we use our clothes rack every chance we get. 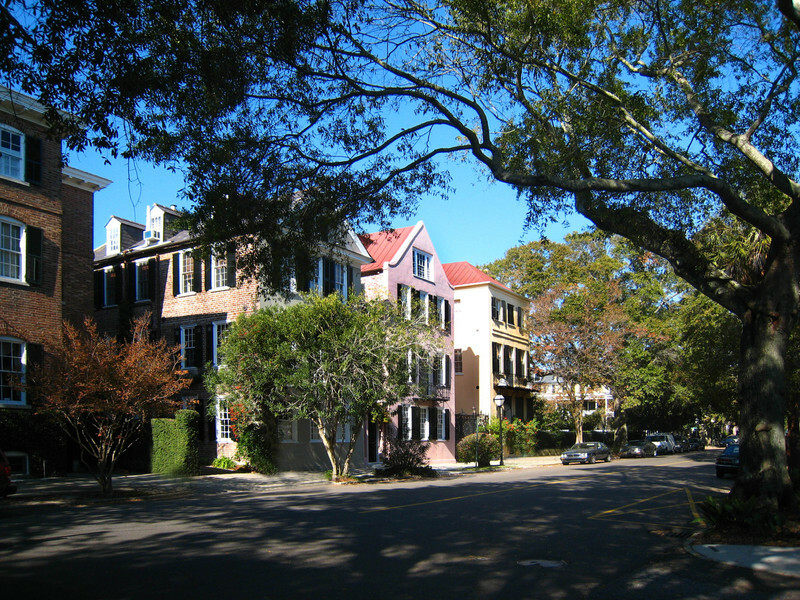 On Monday, we drove into downtown Charleston and took a narrated tour of the historic district. We chose a tour company called "Doin' the Charleston." They are unique because they have a monitor inside their bus on which they show photos of some of the historic people, places, and events connected with Charleston. They also show photos of the interiors of some of the historic homes. In 1663, King Charles II of England granted the Carolina Territory to eight of his loyal supporters who became known as the Lords Proprietor. The first English settlement in the area took place in 1670. Although the City of Charleston has now grown to include quite a bit of surrounding area, the original city, formerly called Charles Town in honor of King Charles II, was located on a peninsula bounded by the Cooper River to the east and the Ashley River to the west. The rivers are named for Lord Ashley-Cooper, one of the original Lords Proprietor. The mainland and numerous large islands extend out into the Atlantic beyond the peninsula forming a large, protected harbor area. By the mid-1700s, Charleston had grown into a major trade center and was the largest city south of Philadelphia and the fourth largest port in the colonies behind Boston, New York, and Philadelphia. During the Revolutionary War, Charleston was the target of two major British attacks because of its status as a major port, but we'll touch on this later. After the Revolution, Charleston continued to grow as a cultural, social, and trade center. In the early 1800s, Charleston became increasingly devoted to state's rights. At that time, a large portion of Federal funds came from import duties and since Charleston was a large port where many imports came ashore, they felt they were paying more than their fair share. In 1832, South Carolina passed an "ordinance of nullification" by which they could repeal a Federal law. This ordinance was directed at the tariffs being charged on imports. Soon, Federal troops were sent to Charleston and began collecting tariffs by force. A compromise gradually reducing the tariffs defused the immediate situation, but the ongoing debate over state's rights continued to fuel the fire that eventually erupted in the Civil War. On Dec. 20, 1860, South Carolina became the first state to secede from the Union. Charleston was the location of the first shots fired during the Civil War. After South Carolina seceded from the Union on Dec. 20, 1860, the cadets of the Citadel Military College located in Charleston fired on a Union ship entering the harbor on Jan. 9, 1861. Charleston was also the site of the first battle of the Civil War when on April 12, 1861, Conferate troops began bombardment of Fort Sumpter, which was occupied by Union forces. 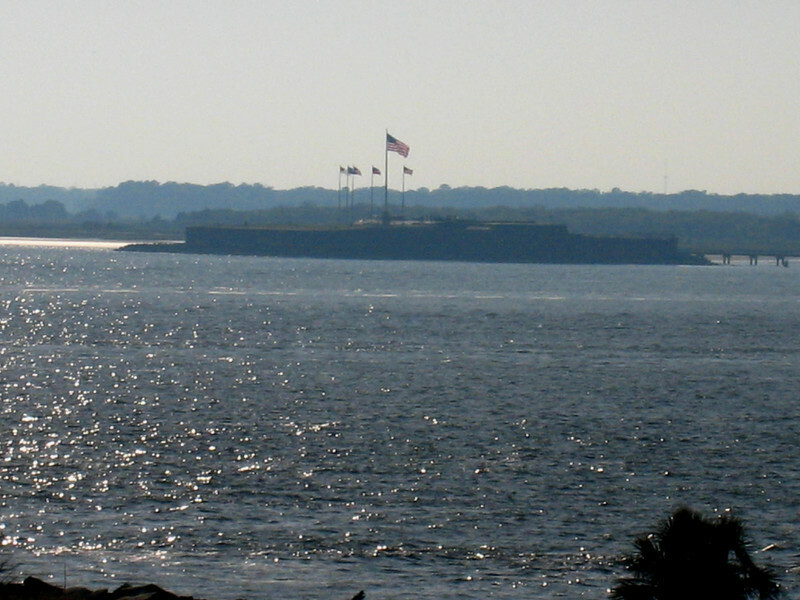 Although the Union troops returned fire, Fort Sumpter is located in the middle of the harbor and was surrounded by Confederate batteries so it didn't stand much of a chance. Union Major Robert Anderson surrendered the fort after 34 hours of bombardment. 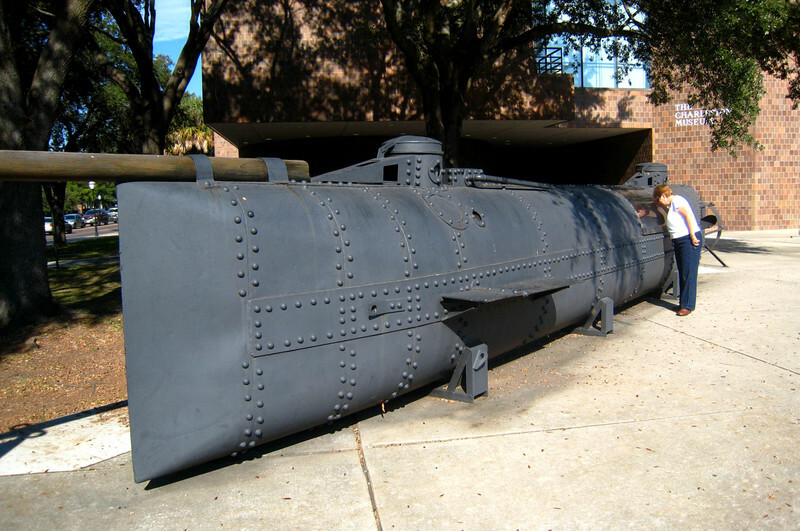 In downtown Charleston outside the Charleston Museum is a replica of the first successful submarine, the CSS H. L. Hunley. The Hunley was built in Mobile, AL and shipped to Charleston by rail. It was 40 feet long and was powered by a single screw turned by a long hand crank that ran almost the entire length of the inside. There was a crew of eight - seven to turn the hand crank and one to steer. The photo below shows Margery checking out the hand crank through a viewing window in the side of the replica of the Hunley. A long spar on the bow carried a torpedo. The submarine would ram the enemy vessel sticking the barbed torpedo into the side. The Hunley would then back away and fire the torpedo by means of a cord. On Feb. 17, 1864, the Hunley attacked and sank the USS Housatonic; but soon afterward, the Hunley also sank drowning all eight crew members. The Hunley lay at the bottom of Charleston Harbor for over 136 years until it was recovered on Aug. 8, 2000. The eight crew members were identified and buried with full military honors. The real Hunley is currently submerged in a specially designed tank at the Warren Lasch Conservation Center near Charleston. The replica, which was built before the actual submarine was recovered, differs slightly in appearance from the real Hunley. The Civil War and the defeat of the Confederacy destroyed the prosperity of Charleston. However, the city eventually bounced back with renewed vitality and population growth. Today, Charleston is a great tourist destination, a major port, and a fairly large industrial center. Although Charleston has had numerous major fires, hurricanes (the latest was Hugo in 1989), wars, and an earthquake in 1886 measuring 7.5 on the Richter Scale, many historic buildings remain. It is these buildings that add to the charm of the downtown area. 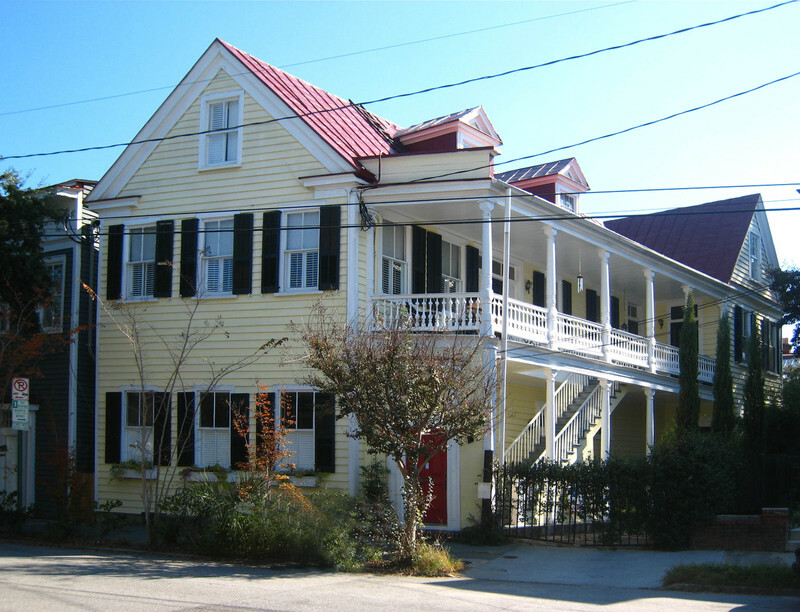 The photo below shows some of the quaint homes in historic Charleston. The style of home that typifies Charleston is the single house. Because the lots in old Charles Town were very narrow, the houses were built only a single room deep and several rooms wide. In order to fit the house on the lot, it was turned with the narrow end facing the street. Porches, better known locally as piazzas, were usually built on all stories of the house and ran the length of the house. The piazzas faced south or west to better catch the prevailing breezes and to shade the windows on that side from the hot afternoon sun. There is a false wall with an entry door on the end of the ground floor piazza, but the main entry to the single house itself is at the side of the house in the center of the piazza. The street entry door of the single house shown in the photo below is partially hidden behind the small tree. The entry to this particular house is actually in the middle of the second story piazza. One of the interesting facts we learned on our tour of Charleston was the history of the dance of the same name. In 1891, Rev. Daniel J. Jenkins, who had previously found four homeless African-American boys huddled together, received a building from the city to house his orphans. Within 4 years, the orphanage started by Rev. Jenkins housed 500 children. Rev. Jenkins taught the children trades and they received education from local teachers. Rev. Jenkins also taught some of the children to play musical instruments. Soon the orphanage became famous for its band and the children toured all over the eastern U. S. On one of the tours, the band picked up a little dance step they did to the music. Soon, the white girls of Charleston began imitating the dance and the Charleston was born. The dance rocketed into the mainstream when it was featured in a Broadway show called Runnin' Wild in 1923. Our 90-minute tour of historic Charleston stopped by the Battery, which is at the tip of the peninsula looking out over the harbor. At this location, cannons were trained out into the harbor for protection. Although the very first shots on Fort Sumpter at the start of the Civil War came from a different location, there was much bombardment of Fort Sumpter from the Battery. Onlookers gathered on the rooftops and piazzas of nearby houses to watch. 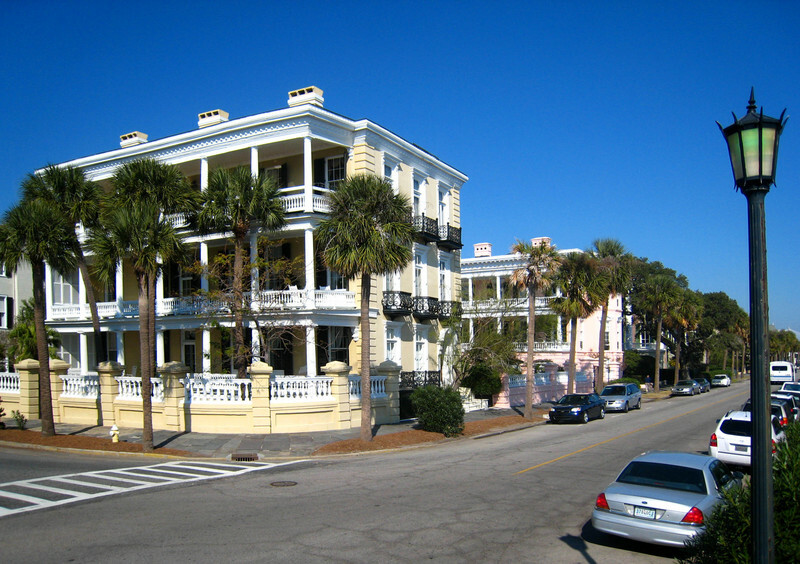 The photo below shows some of the houses adjacent to the battery. After our tour of Charleston, we took a drive across the new Cooper River Bridge heading for Fort Moultrie on Sullivan's Island. 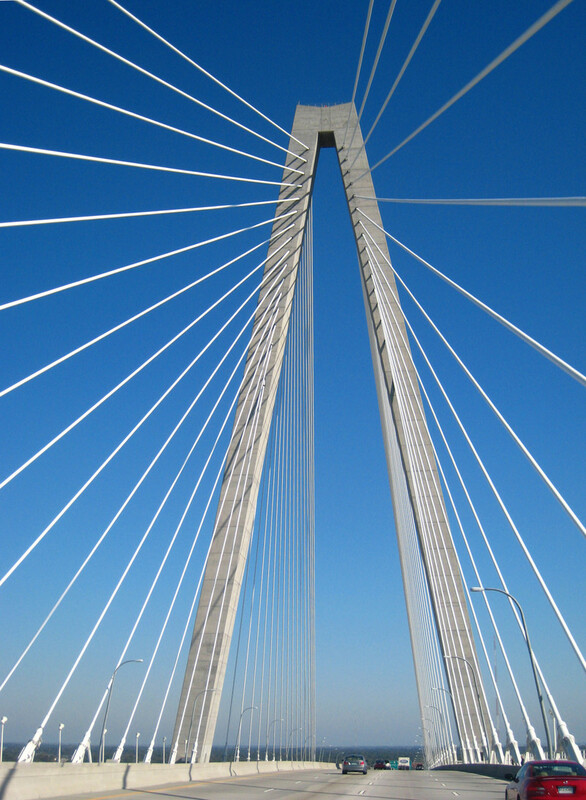 The new bridge was completed in 2005 and features two diamond-shaped towers and graceful steel suspension cables as shown in the photo below. On the way to the fort, we passed Shem Creek. 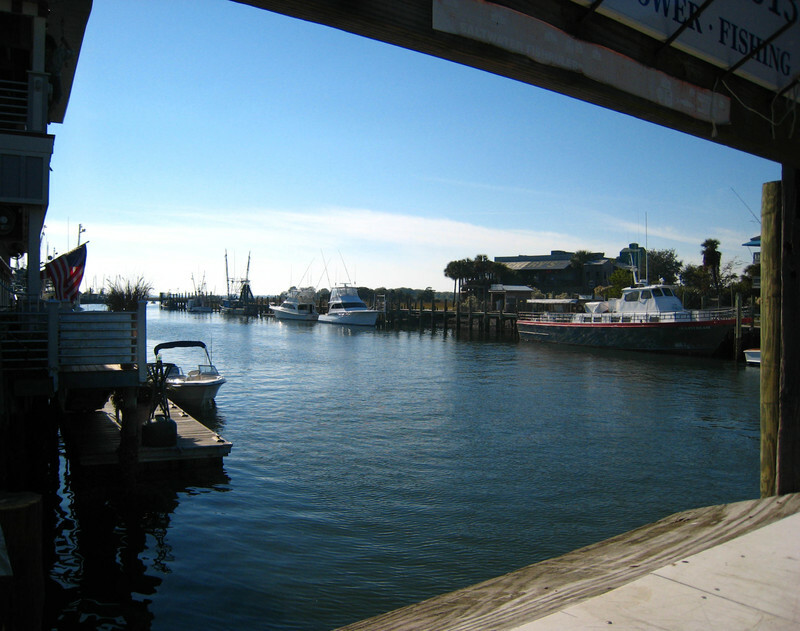 In this area near where the creek flows into Charleston Harbor, the creek is fairly wide and is a picturesque spot where a number of boats are docked and where there are several restaurants. We ate at one of these restaurants when we visited here about 15 years ago on a business trip for Margery to attend a computer software seminar. 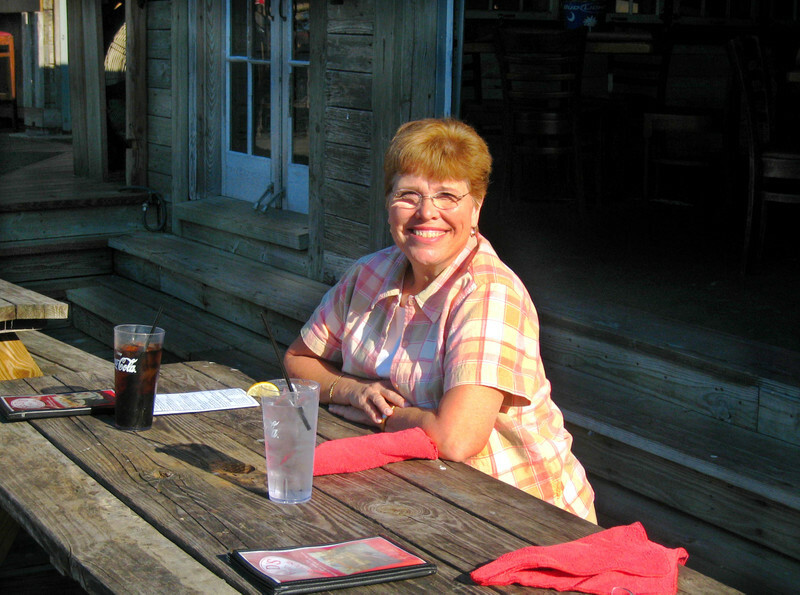 We couldn't remember which restaurant it was (maybe it isn't even there anymore), but we picked out one called Red's Icehouse that had outside seating by the water and that didn't look too expensive. We ordered a crab cake sandwich and a shrimp po' boy to share. Both sandwiches were good, but the po' boy was outstanding. A po' boy is essentially a submarine sandwich frequently made with fried seafood. The photo below shows Margery waiting for lunch to arrive. This is the view down Shem Creek toward Charleston Harbor. After lunch, it was on to Fort Moultrie, a series of forts built on Sullivan's Island to protect Charleston Harbor. The first fort was still incomplete when the British attacked it on June 26, 1776. The original fort was built of logs cut from the trunks of palmetto palms. The green logs were soft enough that they absorbed the impact of the cannon balls causing some of the shots to even bounce off. After 9 hours of bombardment, the British ships gave up and sailed away. The fort was named in honor of its commander during that first battle, Col. William Moultrie. It is from this battle and the strength of the palmetto logs that the state of South Carolina took its nickname, the Palmetto State. In 1780, the British finally captured Charleston and after the Revolution, they abandoned the fort. The fort lay neglected, damaged by hurricanes and stripped for building materials by the local residents. In 1793, when war broke out between England and France, Congress decided the shoreline needed to be protected and passed a bill authorizing the building of 20 forts along the Atlantic coast. By 1798, a second Fort Moultrie was completed. However, this fort was also damaged by a hurricane and fell into disrepair along with many of the other Atlantic coast forts. 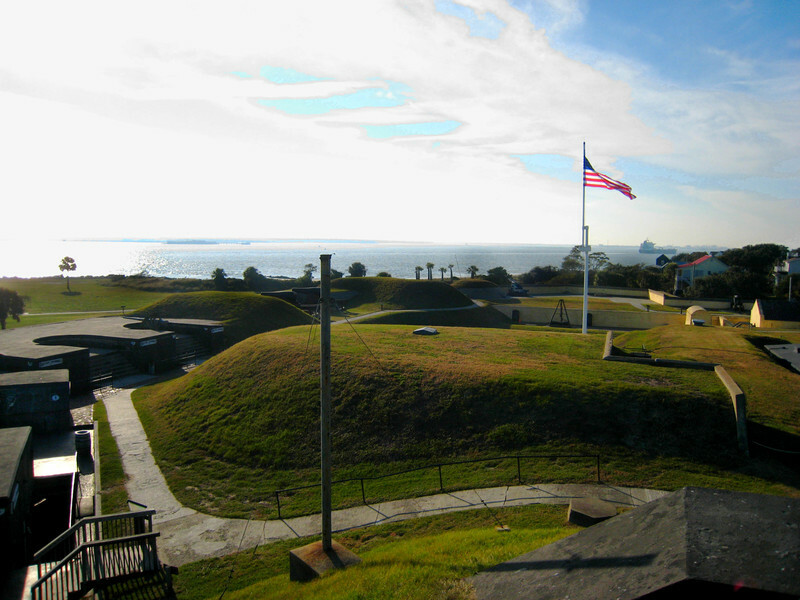 A second series of forts was authorized and by 1809, a third Fort Moultrie was completed. This time the fort was built from brick. In December of 1860 when South Carolina seceded from the Union, the Union forces abandoned Fort Moultrie and moved to the newly built, stronger, and unoccupied Fort Sumpter in the middle of the harbor. As mentioned previously, the firing on Fort Sumpter by Confederate forces marked the first battle of the Civil War. The view below of Fort Sumpter from Fort Moultrie gives you a good idea of how close it was and why the Union forces at Fort Sumpter were forced to surrender after 34 hours of bombardment from Fort Moultrie and the other forts and batteries around the harbor. 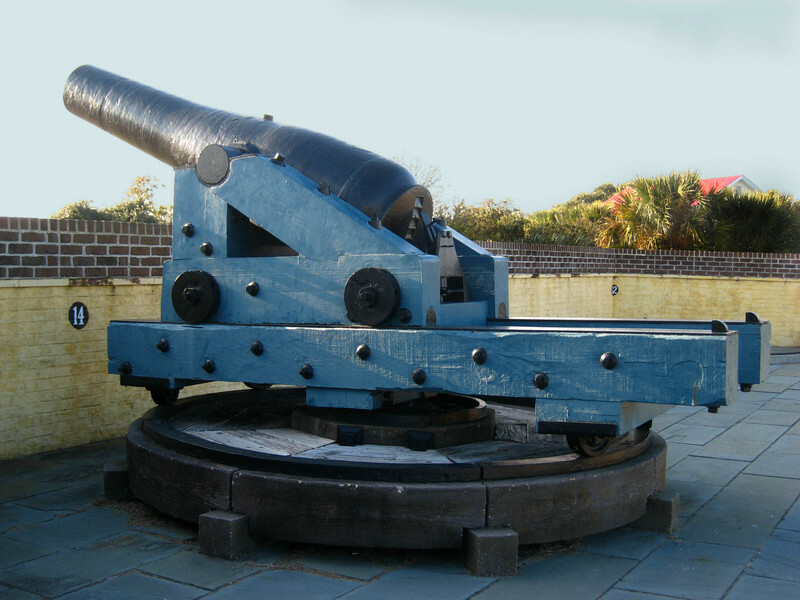 After the Civil War, Fort Moultrie was modernized and updated several times. Today, the fort represents a blend of historic periods. The photo below shows Civil War-era cannon. Below is a view of a portion of Fort Moultrie looking toward Fort Sumpter. Fort Sumpter is the slightly darker area just about at the horizon toward the left of the photo. It seems the most dominant period represented at Fort Moultrie is WWII, probably because it is the most recent. During WWII Fort Moultrie was not only a major means of defense of the harbor from potential submarine and air attack, it was the command center that controlled the movements of all ships entering and leaving the harbor. After WWII, as we entered the age of nuclear armament and guided missiles, the fort became completely obsolete and was turned over to the National Park Service.